My amateur weather forecasting skills predicted a beautiful day in the mountains — a bit of pure luck that’ll soon be rewarded with a lightning strike when cosmic balance is restored. Timing felt right for an Epic Road Trip (why waste all this scenery trudging through a a tree tunnel? ), so we packed a picnic lunch and headed for the hills. The going was easy: we took Exit 55 from I-40 and headed south on the Blue Ridge Parkway on the northeast edge of Asheville. 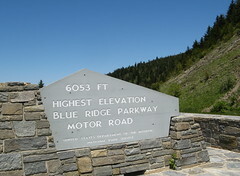 Because the Parkway passes through terrain with annoying habits such as dropping 50 tons of rock on on the road, sections of it are often closed for repairs. We hit one such section just south of Asheville — a detour dragging on for miles and miles through towns and pastures offering none of the hundred-mile vistas we drove a hundred miles to see. 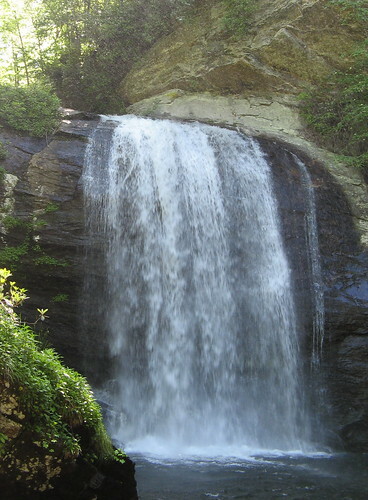 Of course, karma always wins in the end and my grumbling was justly repaid with a turn on U.S. Highway 276, which passes within spitting distance of the gorgeous Looking Glass Falls. The hills should be crazy with these things in a couple weeks. At another stop, Melissa insisted I take some wildflower pictures. 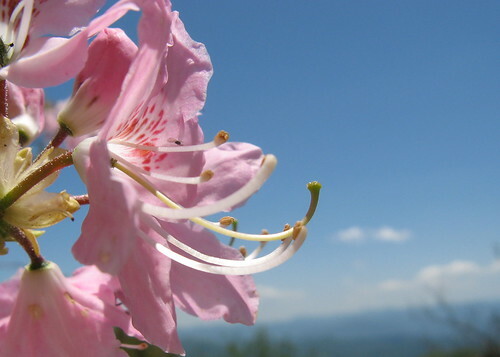 More blooms at the Waterrock Knob visitors center. There’s a short, steep climb to a very nice overlook. More trails beyond if you’re feeling frisky. We ended up having so much fun on the drive down that we had to make the GSMNP visit a quickie: we headed up to Newfound Gap, soaked up the scenery and headed back. 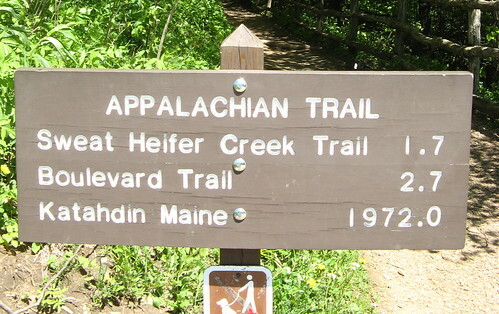 Another for my growing collection of Appalachian Trail signs (mildly amusing: I just typed in “Appalachian Grail,” which seems more appropriate) . The Gap gets pretty crowded on weekends. Probably be a mob scene next weekend. Speaking of the Gap: The nearby road to Klingman’s Dome should open in the middle of June. It’s closed for renovations; didn’t see anything saying you couldn’t just walk up there on the AT — though it’d be at least a 14-mile out-and-back. Sorry for such a quick-and-dirty report this week; got to get on about doing my real job before people get suspicious. I’ll be back to regular hiking next week. Here’s the Everytrail Track, if you’re curious. Mind you it’s crazy inaccurate in a few places because those mischievous mountains kept blocking my GPS signal. 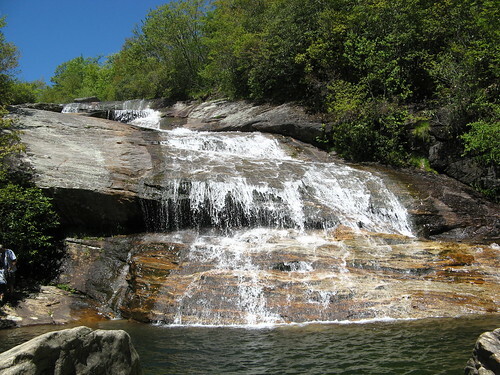 HWY 276 through Pisgah National Forest is a nice drive – lots of trails and waterfalls to see. 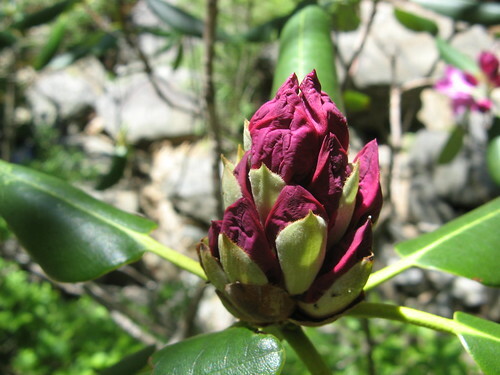 Next time you’re looking for a hike, try the Art Loeb Trail by the Davidson River Campground. 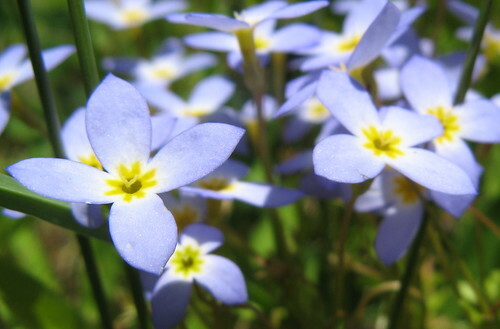 Those wildflower pictures are amazing!! Tom – proves again that there’s a whole natural world out there beyond California that rocks! Tom, I’m so jealous. 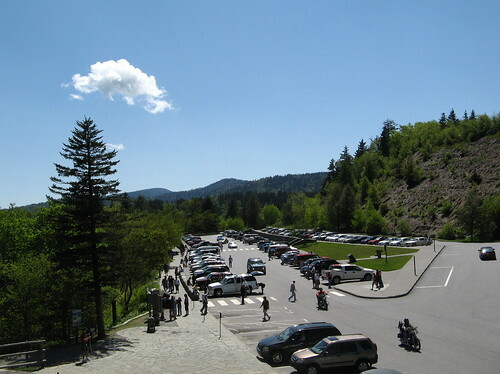 In the two trips we made to the Parkway, we’ve had exactly one day with skies that clear. And ironically, it was the day we walked through Graveyard Fields and took in Looking Glass Falls. We loved the drive down 276 to Davidson River Campground, where we camped for a week. Highly recommend it. Devil’s Courthouse is another short but good walk to a great view, just south of Graveyard Fields. We’ll be back in late June. Hope there are a few blooms left.